Wikipedia describes this photo as depicting a "Historic building in Billings," and that's true. This is a historic building in Billings Oklahoma, but a little bit behind it is that it was the doctor's house and it was considered the grandest in the town. Doctor Thomas Franklin Renfrow's (known as "Doc Renfrow's house" is the way my mother always referred to it. I'll see if she can give me some stories about the house that I can share with you soon. I am NOT related to the Renfrow family, I just thought this was interesting! 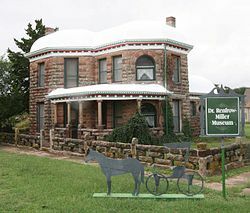 "Unique rock home, famous as "Castle on the Prairie", built in 1901 and was the home and office of pioneer doctor, Thomas F. Renfrow, who took part in the 1893 Cherokee Strip Land Run and settled in Billings in 1899. The two-story rock home features a metal-domed roof, detailed trim and a hexagon-like exterior, along with eight rooms, four rock chimneys, 10-foot ceilings, and massive arched windows with tinted glass. This home has few characteristics of frontier homes built prior to Oklahoma statehood. The home with its unusual Richardsonian Romanesque architecture, is listed on the National Register of Historic Places. Additional contact number is 580-725-3487. Donations welcomed; admission fee applies for tour groups. Guided tours by appointment only." On another website, it's mentioned that the house is made of sandstone that was quarried northwest of the town of Billings Oklahoma.